It&apos;s no secret that Lehigh Valley loves its bacon - just look at the Lehigh Valley IronPigs and all the tasty treats at the ballpark! But for one weekend a year, a local city is transformed into a bacon lover&apos;s dream. Enter: PA BaconFest in downtown Easton. Now in its fifth year, this festival welcomes nearly 75,000 attendees over its weekend run. What started as a themed weekend for the Easton Farmers&apos; Market has truly transformed into one of the Mid-Atlantic&apos;s top events. Browse treats from more then 100 vendors, enjoy performances from musical acts, and so much more - this is definitely an event to pack your appetite! While BaconFest is free to attend, there is a suggested $2 donation that helps the Greater Easton Development Partnership to keep festivals like this returning year after year. This year, you&apos;ll receive a raffle ticket with your $2 donation that will put you in the running for a number of prizes. Each hour on the hour, winners will be drawn for a number of prizes donated by local merchants. Please note that certain events, such as the Dueling Swine Pig Roast and Bacon & Brew Tastings (detailed below), do have separate admission fees. Check out some of the details for the 2016 PA BaconFest below. When sharing on social media, be sure to use #PABaconFest5 and #LiftYourSpiritsDLV! 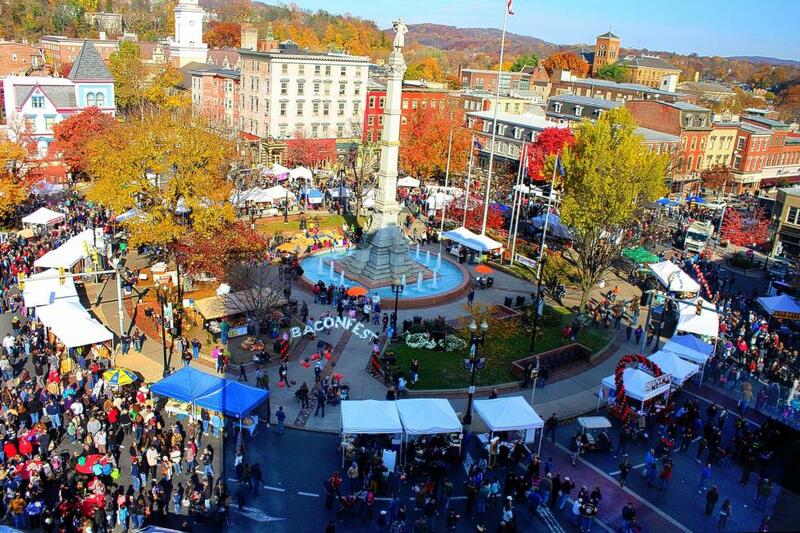 When: Saturday, November 5 & Sunday, November 6, 10 a.m. - 5 p.m. Where: Downtown Easton, Pa. Parking information can be found here. Pig & Wiener Dog Races: (Saturday & Sunday, 11 a.m., 12, 1, 2, & 3 p.m. ) Head down to the 100 block of Northampton St. to cheer for your favorite! The kids will get a kick out of this one. Hog Calling Competition: (Sunday, 2 p.m.) Adults and little squealers can enter (register onsite) for the most raucous event of the day! Prizes will be awarded to first, second and third place, best adult and best child. 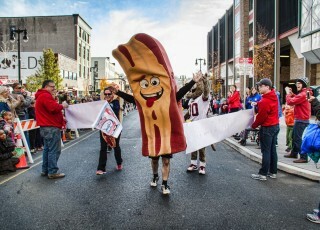 Bacon Dash: (Sunday, 4 p.m.) Cheer on the local mascots as they race around Centre Square. Dueling Swine Pig Roast Competition: (Saturday & Sunday at 1 p.m.) Local chefs go head-to-head in a pig roasting competition. Your $15 admission to this event gives you access to samplings from the chefs&apos; pigs and the chance to vote for your favorite. On Saturday, Dundore & Heiser butchery takes on Chef Abe Lopez of Stoke Coal Fire Pizza. On Sunday, Chef Jeremy Bialker of Two Rivers Brewing Company competes against Chef Mike Pichetto of 3rd & Ferry Fish Market. Ticketed event. Details. Bacon & Brew Tasting: (Saturday & Sunday, 11 a.m. - 5 p.m.) Craft beer fans won&apos;t want to miss this one! Enjoy six varieties of bacon from Breakaway Farms paired with six beers from Weyerbacher Brewing Company. Your $20 admission also gets you a souvenir PA BaconFest glass. Ticketed event. Details. For more details on PA BaconFest, visit their website.